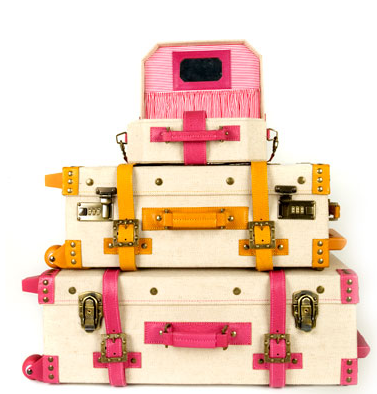 Chic and Charming: I love Streamline Luggage! I love vintage steamer trunks, and vintage-y looking luggage in general. So, I am totally obsessed with Streamline Luggage, a collection of beautiful suitcases that will remind you of the days when travel was glamorous. Streamline luggage comes in several coverings (cloth, leather) and several color styles (candy colored, primary colors, white and tan) and is surprisingly affordable. Santa Darling, do add an entire set to my Christmas Wishlist! Oh. my. god. I LOVE these! The colors are absolutely perfect. I have a feeling I'd never keep them looking that gorgeous if I used them. Too bad, they're perfect. So cute! I want cute luggage.